Need a New Years Resolution? 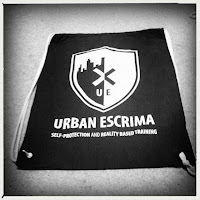 Get Fighting Fit with Urban Escrima! We are running a FREE special Taster Session to help you with your Fitness and Self-Defence New Years resolutions. And as it is the start of a new year and we are in a very giving mood, we are offering a very generous training package just for you! Places are limited, so contact us now on info@urbanescrima.com to BOOK your place on the Taster Session and also to find out about our special new years promotion. The Taster Session is on Tuesday 8th January from 6.45-7.45 at London Fields Fitness Studio E8 3PN. I’m Catherine Webb. I’m from London (Hackney, to be exact)and for half the year I write novels, and for the other half I’m a theatre lighting designer. What type of books do you write and are you working on anything at the moment? Do you have a blog or website or something where we can keep up to date with your work? I write fantasy books, with a bit of other stuff thrown in. I started writing quite young, so as Catherine Webb I’ve got a series of eight or so children’s books which sort of grew up as I did. 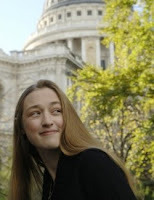 Now I write mostly as Kate Griffin, writing books set in London. However, at the moment I’m writing something completely different – a detective story, set in 1550s Istanbul. It’s not my usual kettle of fish, but I have a massive soft spot for the Ottoman Empire (doesn’t everyone?) and the 1550s are a fantastic bit of history where the world is at once swashbuckling medieval, and simultaneously full of gunpowder and intellectual turmoil. I keep a blog -www.kategriffin.net - which has all my information on it. How long have you been training in Escrima Concepts and what grade are you? I’ve been training about a year, and I’m level two. Are you currently training in any other martial arts or have you done anything before?I did a tiny bit of karate, and a bit of jiu jitsu while at university. My chief memories of karate was being shouted at, and having to crawl up the stairs to my dormitory room after Friday class, almost physically unable to bend at the knees. Jiu jitsu was better, but there was a lot of bowing, tumbling and wondering why the person I was supposed to throw bodily to the floor using only my hip and circular movement, had to be six foot five and weigh seventeen stone. Why did you choose to train in Escrima Concepts? And what do you most enjoy about your training? I chose Escrima slightly by accident. I was feeling very unfit, but knew that if I was going to get more exercise I wanted to learn something useful while doing it. I also knew I didn’t want to be shouted at by an angry Sensei again. 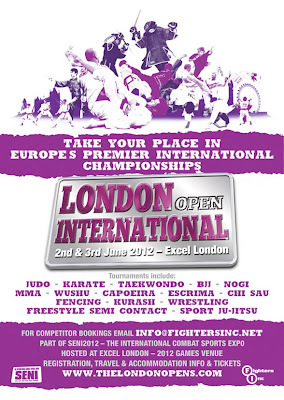 There was an offer to do classes at the London Fields gym, and I saw Escrima on the list. After looking it up on the internet, it seemed a lot more interesting than other martial arts I’d tried, so I gave it a go, and have kept on giving it a go ever since! I think there are two things I like most about training. The first is that, even within certain techniques, everyone does it in a slightly different way. I really appreciate this, as it both broadens your options and simultaneously forces you to learn how to read whoever you’re working with. For example, when sparring with one student, over time you come to notice that he’s good with his live hand and always steps through, which in turn forces you to change what you do. But when sparring with another, you realise that this student always does smaller, tighter moves, and doesn’t necessarily put in his live hand, or only does on certain shots. It’s such a flexible, friendly environment that you can actually get to think about, not merely what you’re doing, but what everyone else does and how that might affect you – and I really like that. The other thing I love is the technical nitty gritty; I really enjoy that moment when you suddenly understand how doing something simple, can lead to something devastating. Are you currently training in any other martial arts or have you done anything before? I did a tiny bit of karate, and a bit of jiu jitsu while at university. My chief memories of karate was being shouted at, and having to crawl up the stairs to my dormitory room after Friday class, almost physically unable to bend at the knees. Jiu jitsu was better, but there was a lot of bowing, tumbling and wondering why the person I was supposed to throw bodily to the floor using only my hip and circular movement, had to be six foot five and weigh seventeen stone. What do you feel is the most important thing you have learnt in Escrima so far? What advice would you give to anyone thinking of taking up Escrima Concepts? When I started, I used half a broom handle to practice getting comfortable with the movements in my living room, as training with any sort of weapon felt really odd for the first few weeks. Don’t be afraid to ask questions that seem trivial or daft, because they’re really not; and remember that if Nigel says something is ‘kinda… okay’ you can probably be really pleased. Check out our latest Newsletter here, enjoy! This month’s student interview is with Vasilisa who has been a regular at our Hyde Park Self Defence training sessions. Let’s see what Vasilisa has to say about herself and her training. Please introduce yourself, where are you from and what do you do?My name is Vasilisa, I am Russian. I used to work as a lawyer in my home country, but I abandoned law for Photography when moved to UK. How long have you been doing photography? Can you give us a link to some of your work? 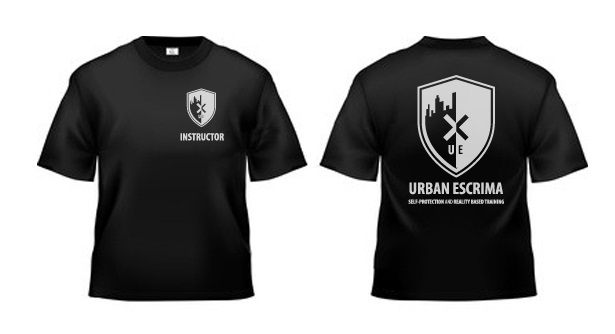 You have been doing the Urban Escrima Hyde Park training sessions right? How is that going?I enjoy our sessions. 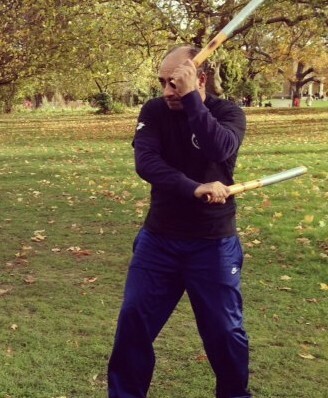 Most of my training is gym based and doing Escrima in the Hyde Park is very pleasant. Are you currently training in any other martial arts? Have you trained in anything before?I am into Brazilian Jiu Jitsu. Also, recently, I started traditional Japanese Jiu Jitsu. 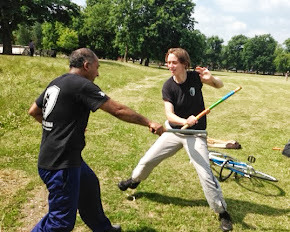 How do you feel training in Escrima Concepts has benefited you?It is an art of combat and self-defence which prepares you to a street situation from the very beginning. One can not underestimate it. Also, I find stick to stick drills very cool and different from what I am used to. What things do you most enjoy training at Urban Escrima?The atmosphere of training is very pleasant and outdoor environment adds into it. Also, besides of being a knowledgeable trainer, Nigel can keep up with a Russian sense of humour, he is just a star. What one thing do you feel you can take away from the training and use in a real life situation?One? There quite a few really. If I have to choose though, it would be the fact that I have more weapons in my bag then I ever thought. 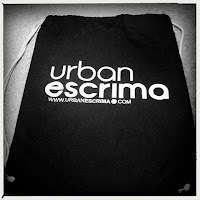 Here is the new Urban Escrima Newsletter. If you want a higher resolution version please email us, enjoy! We now have a range of merchandise in stock. If you would like to purchase any of the below, please let us know. The latest instalment of our ‘Interview With a Student’ series, comes from the long time Urban Escrima student, Nacho. Over to you Nacho. Please introduce yourself and tell us what you do? My name is Nacho, I am 31 year old and I work as a chef in The Gallery Cafe, a vegetarian cafe in Bethnal Green . I love basketball and I am trying to learn as much as possible about bike mechanics in case I get tired of cooking. Me and my girlfriend help a friend who works in the charity Dog Trust fostering dogs which are going be put to sleep or have been mistreated. I think I have been vegan for about 8 years, I don’t know exactly because before that I was vegetarian but I would hardly eat any dairy or eggs, just occasionally, one day I just decided to stop consuming animal products completely but don’t remember when that day was. Sport wise I think it has been good for me and I have proved my personal doctor, my parents, coaches and friends that a plant based diet works, and if works for me can work for anybody else. How long have you been doing Escrima Concepts and have you had any other martial arts experience? I have been doing Ecrima for a bit over one year. I didn’t have much experience in other martial arts apart from a bit of taekwondo when I was a kid. Why did you choose Escrima as opposed to other martial arts? Because a friend was running his own club and I was invited to check it out, after 2 or 3 weeks it started making sense to me and I got hooked so I can say I am glad that I was invited. 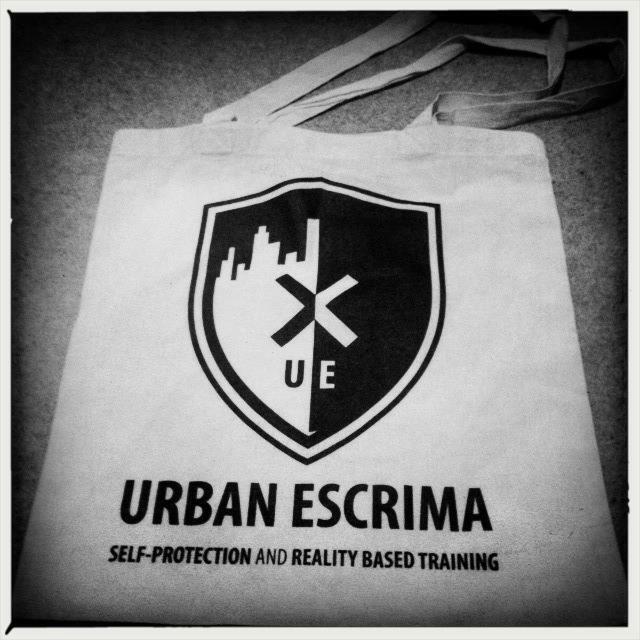 What do you most enjoy about training at Urban Escrima? I like everything really, especially the atmosphere and how the instructors run the class. If i had to choose something I would say when we train unarmed , when we learn to defend ourselves without sticks or just with “weapons” like keys, mobile phones…I think this is really practical as we carry those things in daily basis but I understand as well how important is to train with sticks or other weapons because learning to use them will give us the knowledge to know how other people will use them and therefore defending ourselves against them will be more effective. 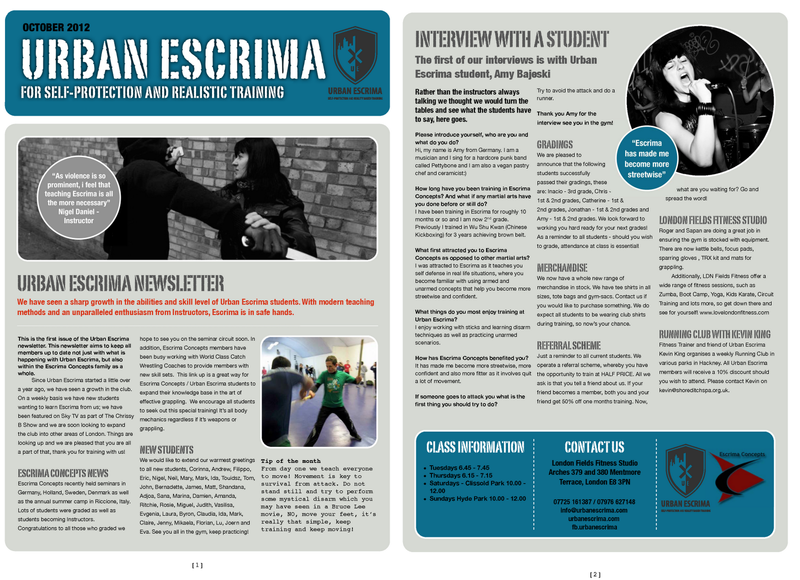 How has Escrima benefited you? It has given me confidence and taught me some common sense tactics in case I suffer an attack or an assault. Before I started Escrima I don’t think I could have survived an attack from a stab for example, now I think that despite of being likely to get hurt I think I have chances to save my life. It is one of the most important concepts in Escrima and means to move out of the line of the attack to avoid it, rather than meet the attack or match it with power it is important to move to one of the sides of that line. For example with a stab the last thing we should do is to try to stop it without moving, grabbing the aggressor hands or the knife (I guess that everybody knows this) or something like that is very dangerous and it is likely to end very bad. I would like to say that is not just moving for the sake of it but it is important to end in a good position, facing the aggressor or training partner and in a good range distance. I hope to be right…. Thank you so much for the interview Nacho, see you in the gym soon! 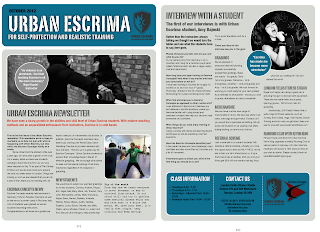 Welcome to the first of our monthly interviews with students at Urban Escrima. Rather than the instructors always talking we thought we would turn the tables and see what the students have to say, here goes. 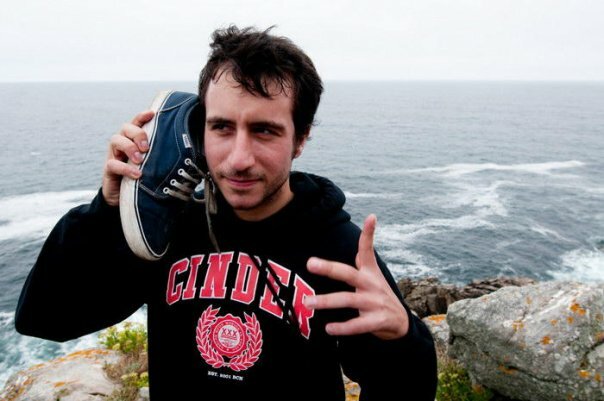 Please introduce yourself, who are you and what do you do? How long have you been training in Escrima Concepts? And what if any martial arts have you done before or still do? I have been training in Escrima for roughly 10 months or so and I am now 2nd grade. Previously I trained in Wu Shu Kwan (Chinese Kickboxing) for 3 years achieving brown belt. What first attracted you to Escrima Concepts as opposed to other martial arts? I was attracted to Escrima as it teaches you self defense in real life situations, where you become familiar with using armed and unarmed concepts that help you become more streetwise and confident. I enjoy working with sticks and learning disarm techniques as well as practicing unarmed scenarios. How has Escrima Concepts benefited you? It has made me become more streetwise, more confident and also more fitter as it involves quit a lot of movement. If someone goes to attack you what is the first thing you should try to do? Thank you Amy for the interview see you in the gym! 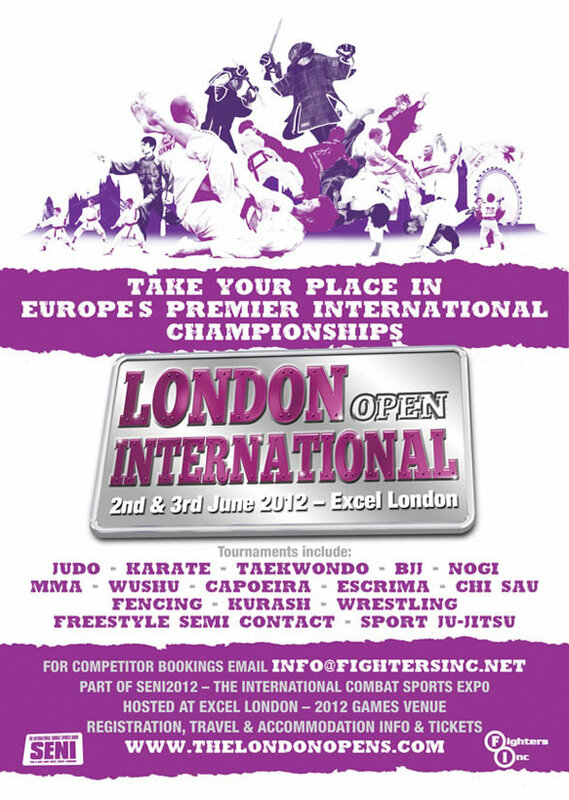 Urban Escrima would like to give a warm welcome to visitors of the London 2012 Olympic Games. Team GB is excelling in all the support its getting. Everyone seems to be lifted by witnessing so many amazing performances. London is alive with excitement, energy and anticipation of more great displays. 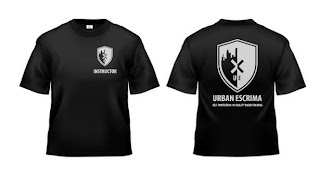 Those of you inspired to to get fit or learn something new are welcome to come along to Urban Escrima classes for some energetic, fun training sessions. We are just a short journey from the Olympic Park. See the Contact Us page for details. Urban Escrima on Sky TV! Chrissy B Show - Learn To Defend Yourself from UCKG TV Production on Vimeo. 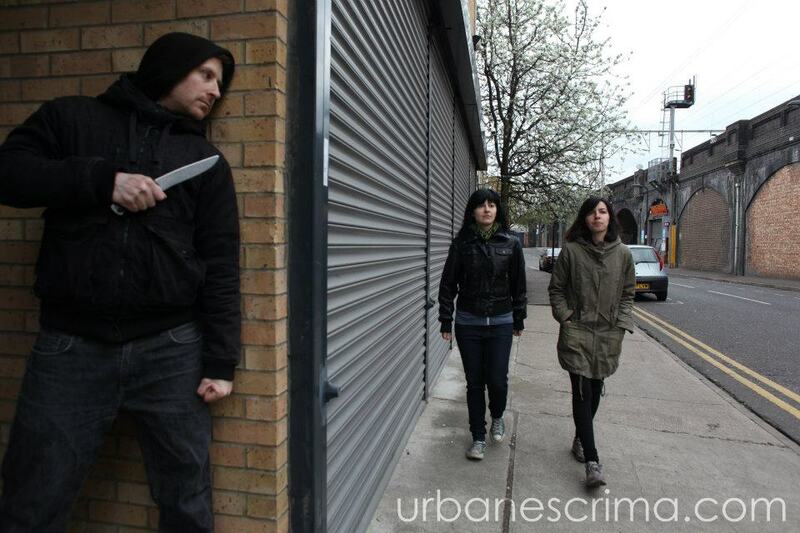 Urban Escrima will be featured on Sky TV's channel 219, 'The Chrissy B Show' on Wednesday 20th June 9.30pm-10.30pm, where we explain and demonstrate scenario based self defence. 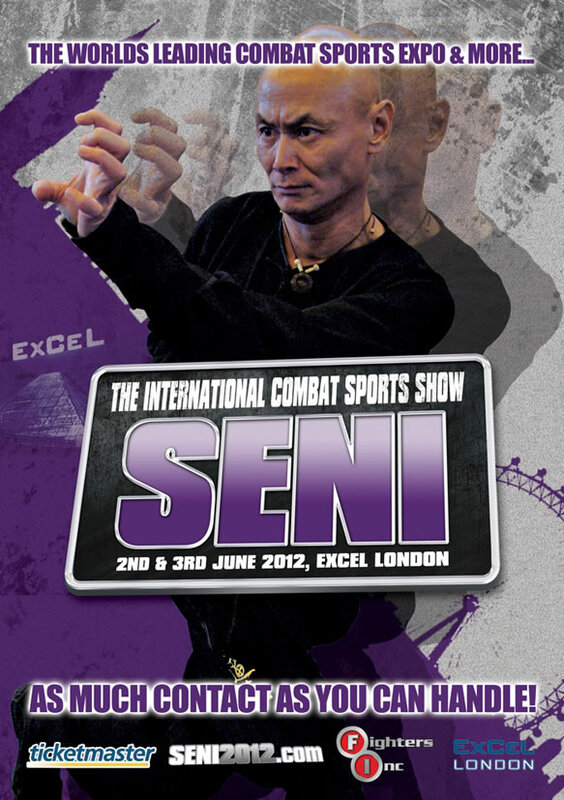 Escrima Open Championships will be held again at the Seni Show at the London Excel on 2nd June 2012. 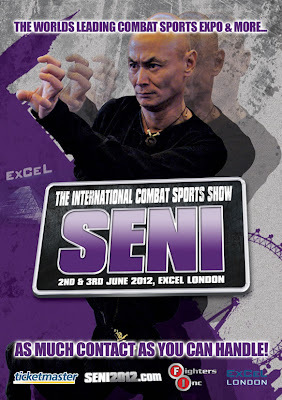 Please check out www.senishow.com for full details of the whole Expo. Here are a few of the treats in store: Karate, Taekwondo, Fencing, Chi Sau, Amateur MMA, BJJ, NO GI, Judo, Capoeira Campeonato, Kurash, Wu Shu, Freestyle Wrestling, Escrima, BTC Team Championships. 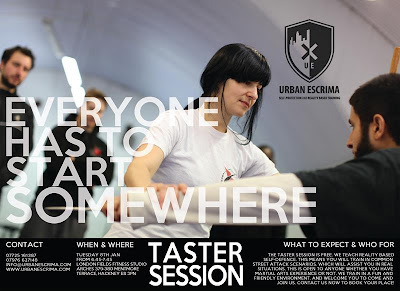 The next Urban Escrima Taster session is on: Tuesday 5th June 6.45 - 7.45 at London Fields Fitness Studio. You are welcome to come along and bring any friends as well. If you would like to attend, please fill in the form below. 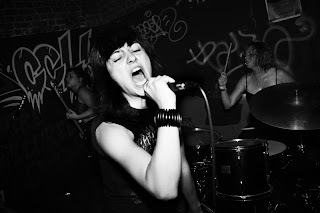 Recently we had the pleasure to have photos taken by a friend of ours called Luke. There are just a couple of samples until we upload the rest. Six tips to think about when walking home at night! Do you feel insecure when you are walking home at night? Have you thought about what you would do if something does happen to you? Most people do not think about personal safety until something happens to them and by then, it is too late. What we are about to outline may seem like common sense, but the risks people take unknowingly is quite worrying. • Do you listen to your mp3 player with headphones in? Have you thought about how your senses are impaired when listening to music? Are you able to hear someone approaching you? Next time you are walking alone or going for a run through a quiet area – think twice about listening to music – stay alert! • Do you carry a weapon in your hand? If you have read any of our previous articles you will know that a weapon can constitute a pen, your mobile phone, a mag lite anything that can hurt and is easy to hold? If you do not already do this, we highly recommend that you do. Most of the time an attacker will expect compliance and not to be attacked back. A mobile phone is is something which you will more than likely be holding anyway and can be used as an effective weapon with the right training. • Clothing can be a major hindrance and is something that you should consider before stepping out for the day. Do you wear high heels? Would you be able to run in them if needed? Do you use a scarf? A scarf is something which the attacker can grab or worse can use to strangle. It is important to think about your clothing and to be practical with it. • Perhaps the most important tip is the way you carry yourself. Do not give your attacker any reason to see you as a victim. Walk tall, walk straight and walk with a purpose. When approaching someone, whether they are a threat or not (you may never know who is a threat), look at them, make eye contact, no matter how difficult that is and be as confident as possible. • Lastly, if you are lost, under no circumstance should you get a map out. Even if you are completely lost – continue walking until you come to a bar, cafe, restaurant or a lighted area where you feel safe. Do not look lost or ask strangers for directions unless you feel absolutely safe to do so. Next time you go out, please think about some of the above and consider what you might do to increase your personal safety – take no chances. There are many other example of personal safety and the above are just some of the things that we feel everybody should consider when walking alone and at night. 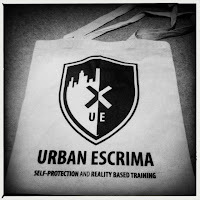 If you would like to know more about our Personal Safety and Street Awareness courses, contact us on info@urbanescrima.com or go to www.urbanescrima.com for further information. Thanks to Duarte for doing such a great job on the site and also to Luke for the photos and everyone else who helped in some way. 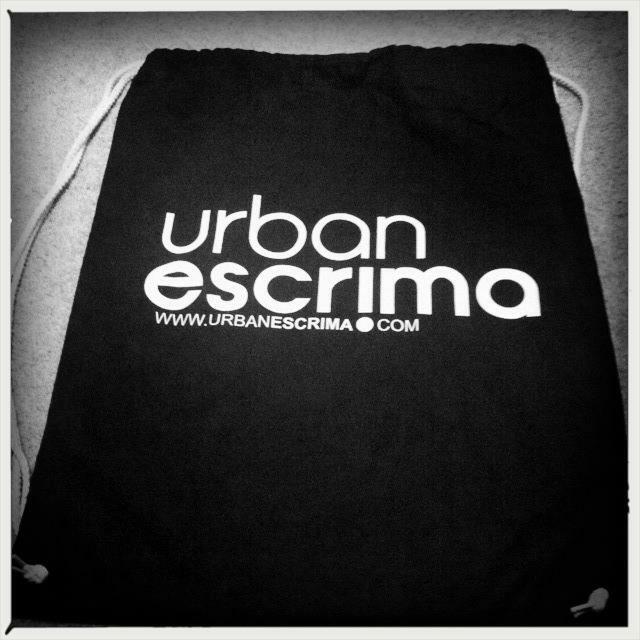 Urban Escrima 1 Year Old Today! Yes that's right, it’s our 1 year anniversary! The club has steadily grown, from the first few lessons where the Instructors only had each other to train with to an excellent group of students who we hope will be the next generation of Escrima Concepts Instructors. We want to thank Big Paul Leslie and Master Steve Tappin for all their assistance and encouragement in helping us to set up Urban Escrima and big thanks to Roger and Saphan for given us the opportunity to train at London Fields Fitness Studio and for all the help they have given us. Importantly though, thanks to all the students training with us, we hope that you get as much enjoyment out of the training as we do from the teaching. We are having a taster session on Tuesday March 6th at London Fields Fitness Studio, London Fields, Hackney from 7.00 - 8.00. 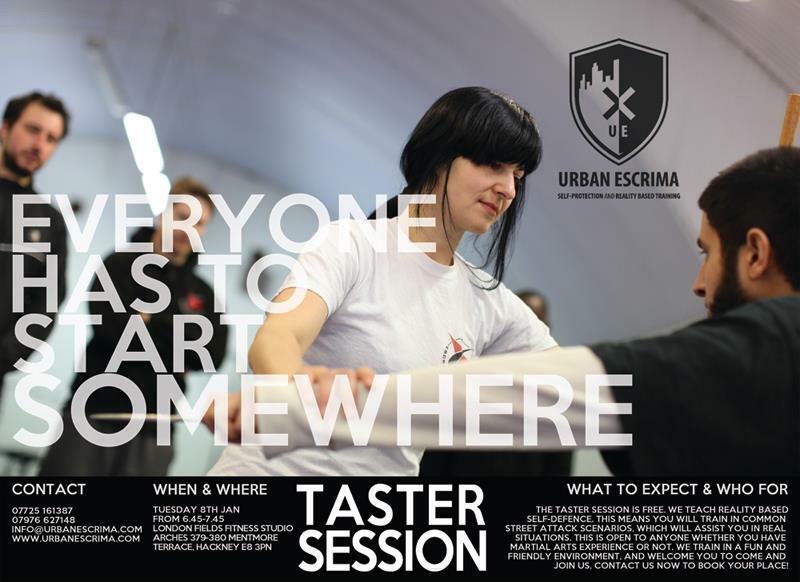 The taster session is a great opportunity to come along and try Escrima and to see whether this is the martial art for you. You are welcome to bring friends as well. We look forward to seeing you there, if you wish to attend please send us an email below. There are many, many books out there which teach techniques and martial arts responses to violent and street attacks. Very few however, really demonstrate or show the realities of attempting to 'apply' a martial arts technique in confrontational situations. 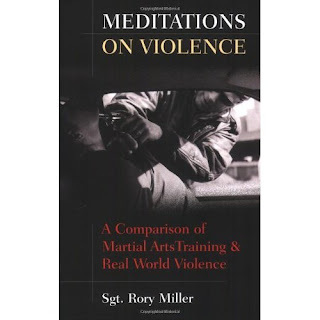 Meditations on Violence is a very important book for those who wish to understand that successfully surviving a violent street confrontation is just as much a state of mind than they are of your martial arts skills. Great weekend at the Escrima Concepts seminar and well done to Albert for getting his 1st TG!